Attend the state committee meetings, where DPG business is addressed and voted on. They occur at least once annually. Be an active members of our voter and public outreach activities–get more people as involved as you are! To be a member of the state committee, you must be a resident and registered voter in Fulton County. There are 22 seats available across the entire county, and those positions will be voted on by post seat holders (listed here). Each Fulton County Commission District may have at maximum four (4) state committee members elected from it. Candidates may also give a short speech of approximately one minute before the entire county committee. 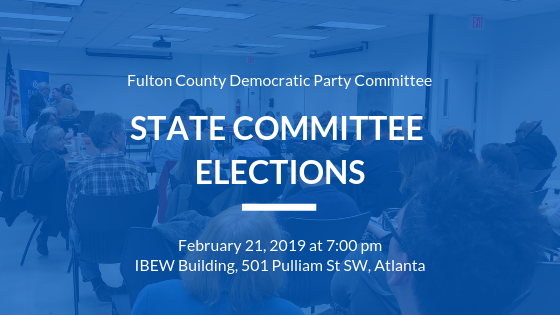 If you would like to run for one of the state committee seats you must show up on February 21 at the FCDP regular business meeting at 7:00 pm in the IBEW Auditorium at 501 Pulliam Street, SW, Atlanta 30312. Beyond this, all required forms will be present at the meeting. If you have any questions, please contact the Membership Chair, Sean Calahan at Membership@fultondems.org. We look forward to seeing you all in February!